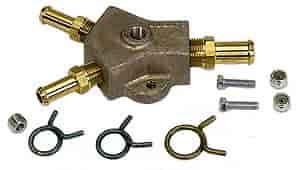 Y-block has 1/2" NPT inlet and (2) 3/8" NPT outlets with 1/8" NPT provision for fuel pressure gauge and socket head pipe plug if not used. Included are fittings with clamps and mounting bolts with lock-nuts. Solve dual fuel line problems and assure equal flow and pressure for twin carb or dual pickup tank setups. Each block features one hose inlet, one 1/8'' NPT provision for a pressure gauge and two hose outlets. Includes two mounting bolts and a 1/8'' NPT plug in case you don't run a pressure gauge.